Muhammad won a bronze medal in women’s team sabre fencing. 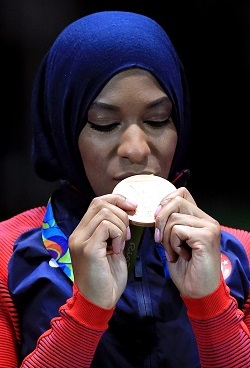 As many star athletes do for their people, Ibtihaj Muhammad has become a symbol and a spokesperson for Muslim Americans. It’s not just because she won a bronze medal in fencing at the 2016 Olympics in Rio de Janeiro, Brazil. It’s not just because she competed while wearing a hijab headscarf, the first U.S. Olympic athlete to do so. It is also because she has accepted and embraced the role. Muslim athletes whose opinions were sought during the 2016 Presidential campaign of candidate Donald Trump are answering questions from the media in 2017 about President Trump’s proposed travel ban on individuals from certain Muslim-majority countries. Among the Muslim athletes who have publicly condemned the ban are NBA center Enes Kanter, retired NFL lineman Ryan Harris and British track and field legend Mo Farah. I wonder if Trump read her letter ? Did he tweet about it ?